EDjobsND.com is the official job vacancy site of the North Dakota Council of Educational Leadership. It is home of the most complete job listing service for North Dakota’ schools. 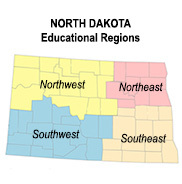 Unlike other services, this site contains only the official postings of North Dakota schools. Old postings are automatically removed. North Dakota school districts can click HERE to download an enrollment form. The Résumé Service allows you to list your unique profile and the service will automatically notify you via your email when a new job is posted that fits your profile. Spread the word …EDjobsND.com is the place to go for the most complete and current North Dakota educational vacancies.